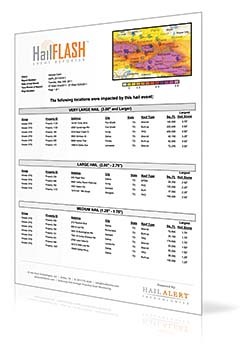 The HailFlash™ event reporter is offered on a subscription basis and automatically alerts users when hail falls on their monitored properties. Through the use of geo-coded weather data and a proprietary hail-detection algorithm, the exact time and place where hail falls is noted. The information is then emailed to the users, detailing size, location and time of event to allow for the client to conduct an inspection of the designated properties' roofs, and identify hail damage.